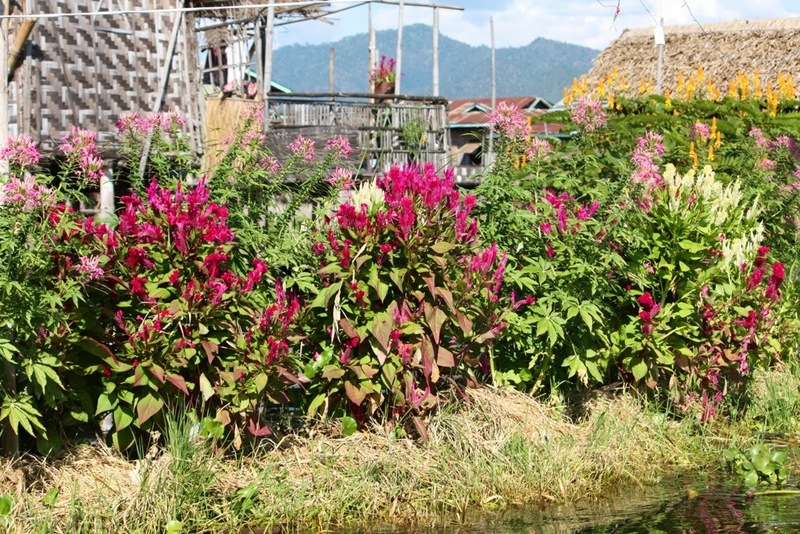 If, like me, you’re accustomed to gardening on dry land, Inle lake in Burma is a bit of an eye-opener. For here the fruits float and the veg ride the ripples of a vast, idyllic lake. The lake itself is situated about 2900ft above sea level, bordered on either side by mountains which bring frequent rain, the lifeblood of the lake. The weather is cool, although not cold unless you’re on the water very early in the morning when blankets of mist hover over the smooth surface. Below, a view of the lush rice fields at the head of the lake, taken from the Red Mountain Winery. 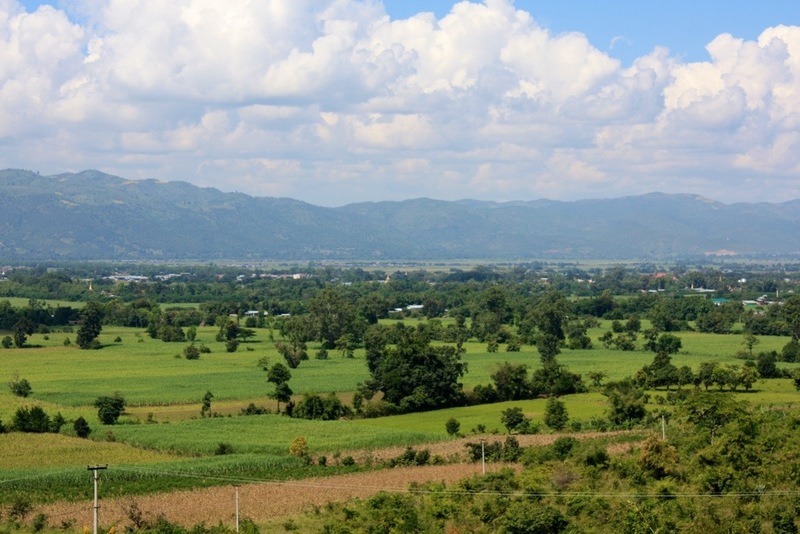 Inle lake is about 14 miles long and 7 miles wide at its most expansive. Roughly 25% of the surface is covered by carefully tended floating gardens. The sight of the long rafts of vegetation bobbing up and down in the wake of the locals’ motorised narrowboats is quite disconcerting at first. 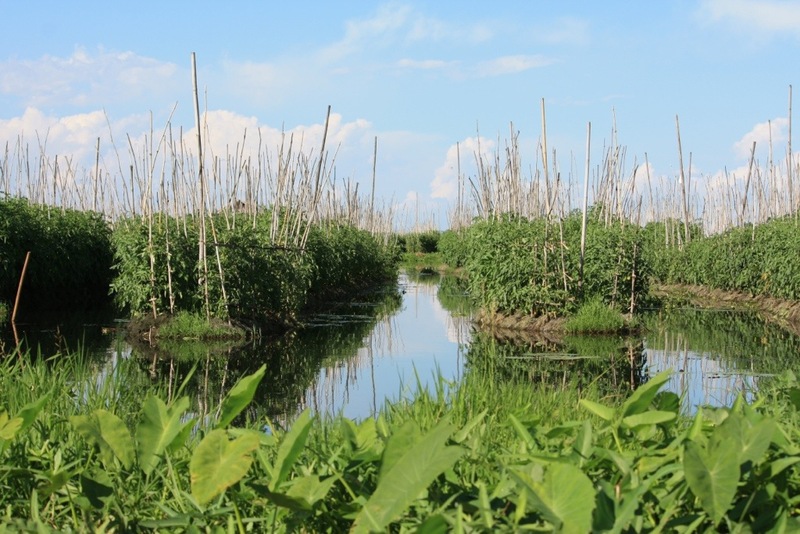 The farmed strips are nominally protected by an outer barrier of reeds and water hyacinths, which in the villages are planted with colourful annuals such as Cleome and Amaranthus. Farmers here on the lake are relatively wealthy, but due to concerns over silting up, pollution and the impact both could have on the crucial fish population, the villagers are not allowed to expand their “land” any further. Firstly, naturally occurring clumps of water hyacinth, “seagrass” and other lake debris are captured by the farmer and secured in position using bamboo poles. These are driven into the deep mud at the bottom of the lake, in areas of water between 1 and 5 metres deep. “seagrass” is heaped on top, with a final layer of fine mud from the bottom of the lake. Eventually the mats become 1m thick with about a third of that above water level. They are very stable, although I declined an invitation to stand on one. What a coward! Seed is planted in the fertile mud and the young plants are supported by bamboo canes. Depending on the season they are used for tomatoes, cucumbers, gourds and pulses, but are, unsurpringly, not suitable for root vegetables. There’s plenty of space to grow onions, garlic and carrots on dry land around the shore of the lake, and rice is also prolific here. Inle’s tomatoes are the finest in Burma and are picked green, or just blushing, and transported all over Burma during the 8 month growing season. They are used to make a classic Burmese tomato salad, which includes sliced tomato (no pips), sliced shallots and peanuts, bound in a sesame seed dressing. Follow this link to The Asian Grandmothers Cookbook for a tasty derivation of this dish. It sounds idyllic, and it is. 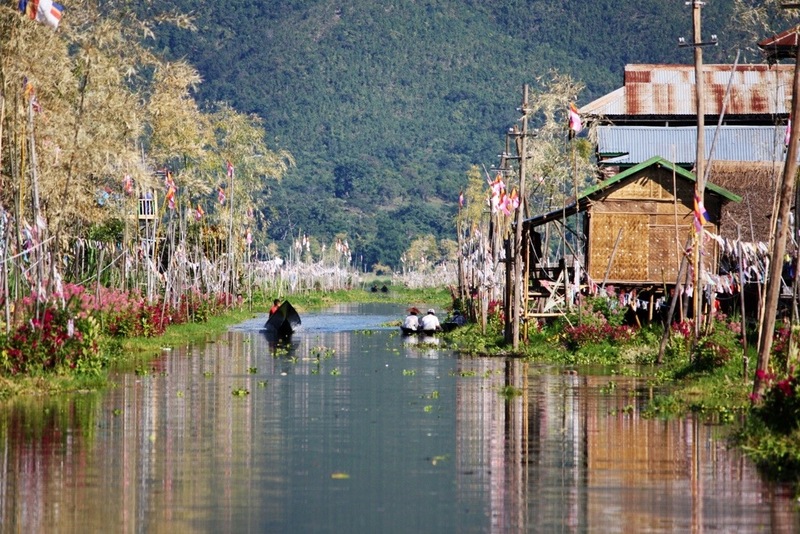 However modernisation is bringing with it new issues for Inle’s famers. Introduction of “better” seed varieties from Thailand and China has meant increased use of pesticides and fertilisers. These in turn have polluted the lake, encouraged non-native water hyacinth growth and reduced the oxygen content of the water, which could damage the fisheries. To combat this, foreign snails were introduced as a biological control to eat the water hyacinth. Unfortunately, as any good gardener knows, snails are not known for being discriminating and have proceeded to eat everything, including indigenous snails and the tomatoes! 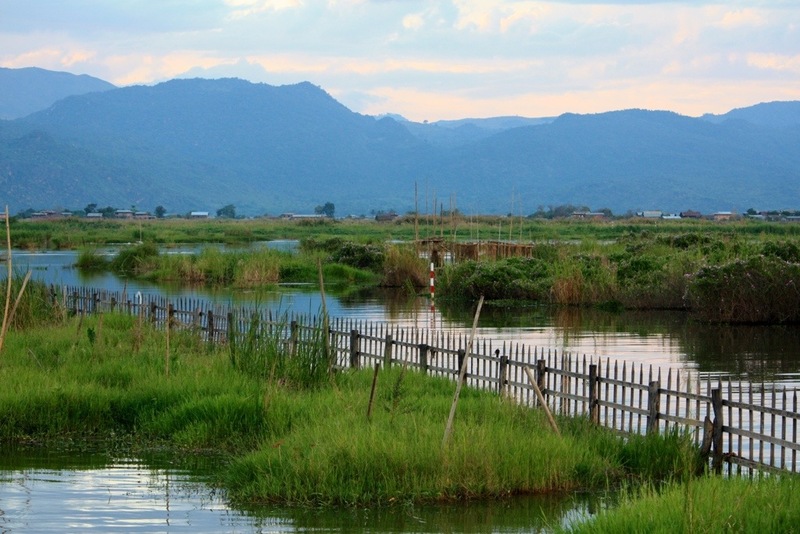 Despite this, Inle remains a tranquil, even romantic place for foreign visitors. Hopefully it will retain its unique character and friendliness as Burma reopens to the rest of the world. My kind of travellers you are…. Thank you Jack. Going to Nepal and Bhutan in spring, which I am very excited about….although I am not sure there will be many of gardens to report on. Main mission is to see lots of interesting plants in the wild.